Manifold systems are widely used with underfloor heating and this same principle can be applied to wall hung radiators. By using an Emmeti manifold system in a point to point configuration you can greatly reduce the number of joints in your system, speeding up installation time and vastly reducing the chances of a leak. Caption: Example showing a house with a Type 2 manifold system supplying each radiator individually upstairs with an UFH manifold system downstairs. A thermostat per zone provides individual control to each room. Taking this approach a step further by using one of our Type 2 range of manifolds, which enables independent time and/or temperature control of each individual room or zone in the building. This allows the home owner or building occupier to tailor their heat to suit their lifestyles. This is proven to be a more accurate method for maintaining a comfortable temperature within a space as each thermostat is mounted in an optimum position rather than TRVs (Thermostatic Radiator Valves) which are fitted directly to the radiator. The use of a thermostat per room/zone makes it much easier to create ideal comfort levels and prevents the unnecessary heating of unoccupied rooms improving the energy efficiency of the building by up to 40%. (Research carried out by TACMA (the BEAMA Controls Group) at Salford University). In addition to the pipe work a key component is the Underfloor Heating manifold and the associated controls. At Emmeti we offer an extensive range of high quality manifolds and controls plus all pipe and accessories required to form a full system solution. Type 2 (T2): These are distribution and control manifolds which are designed for either wall hung radiator or underfloor heating (UFH) systems. The manifold is fitted with an electrothermic valve fitted to the return bar and double regulating lockshield or flowmeter fitted to the flow bar to balance and control each circuit; this replaces the TRV and lockshield on a radiator. The electrothermic valves are controlled by a thermostat or programmable thermostat, via a wiring centre. How do Emmeti T2 Heating Manifolds Work? Example of domestic building with installed Type 2 manifold system with Wall Hung Radiators. Type 2 manifolds can be used in heating applications not only for radiator or other heat emitter based systems but also for underfloor heating/cooling systems using a separate low temperature heat source or mixing valve control set. For radiator based or perimeter heating systems time and temperature control is centralised at the manifold allowing individual room temperature control if required. No TRV is needed in the room itself which can be controlled by a room thermostat or programmable room thermostat. The thermostat is wired back to the manifold via a wiring centre which requires electrothermic heads on the return bar. This method is in compliance with Building Regulations Part L1 (conservation of fuel and power) and best practice GPG301, 302 and GIL 59 (CHeSS). The function of the TRV (temperature control) and the lockshield (balancing) are now integrated on the manifold. More importantly, the electrical interlock required by Building Regulations Part L1 is provided directly by the thermostats controlling room temperature. This state of the art option is pre-assembled onto a metal bracket, making for quick and easy installation. It has an electrothermic body integrated for each return circuit, ready to be actuated by the electrothermic head. 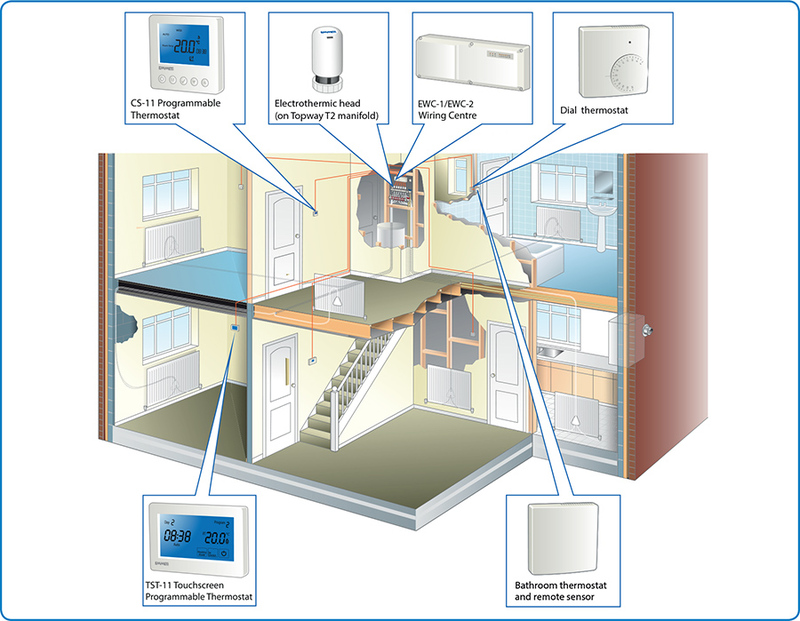 The electrothermic heads are connected to the room thermostats located in each room or zone, via a central wiring centre. 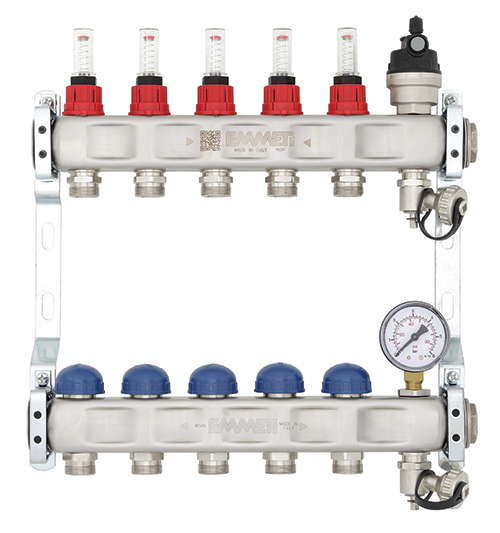 The manifold includes lockshields or flowmeters on the flow rail, with double regulating function for individual circuit isolation, and manual setting of flow control for heat balancing per radiator. It also includes automatic air vents and drain-off (filling) points as standard. All of these reduce commissioning time, no longer having to physically move to each room or zone to balance each radiator. Central control for distribution, manual isolation by circuit or by floor, commissioning of each zone by balancing, system air venting and automatic “electrical” flow isolation when a room is up to temperature. This also allows individual circuit purging. Measuring of flow using flow meters, allowing reading of dynamic flow during balancing. Measuring of temperature using thermostats integrated into the ball valves, one on the flow and one on the return rail. These aid installation by allowing the installer to verify the hot water is flowing, and how much, as well as what flow and return temperatures are being achieved. Differential by-pass, to prevent pump wear and tear. Time/temperature wall stats, with set back facility, for the individual zones or rooms. Wiring centre, allowing boiler interlock and pump stop/start. Installing this kind of system can save a significant amount of money on fuel bills. It is particularly appropriate for use with public access buildings, like offices, schools and hotels. However with the increasing emphasis on legislation to save energy in both new and existing homes, Emmeti Type 2 manifolds offer a cost effective solution to professional installers and specifiers in meeting today’s more stringent requirements. 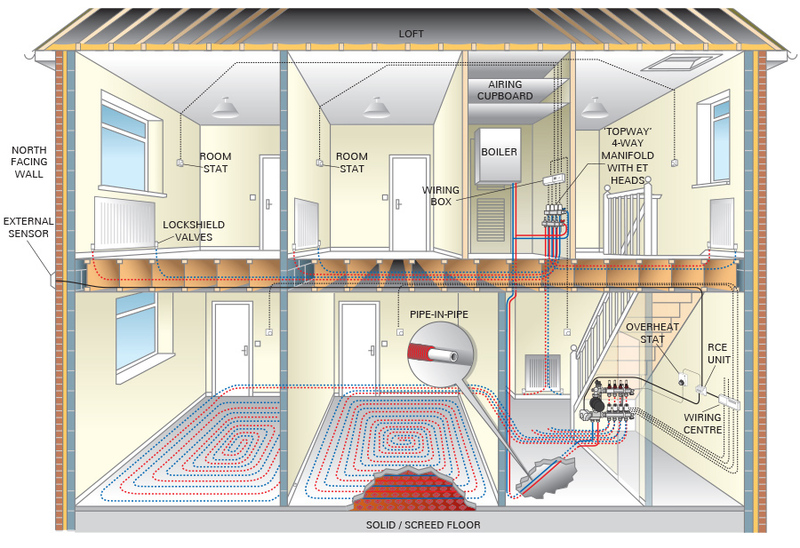 By using a central manifold each room within the property is essentially a separate zone. Each room will have a wall mounted thermostat located in such a way that it will measure the room temperature more accurately than a conventional TRV (Thermostatic Radiator Valve). The thermostat will activate the relevant electrothermic head when a call for heat is required. The electrothermic head will be energised and open the circuit that is calling for heat sending heated water into the system. This ensures that only the room that is calling for heat is being heated at any given time which greatly reduces the amount of energy being generated by the heat source. A conventional system will deliver heated water to the entire system with each radiator being heated unless isolated. For example, a typical family will spend most of their evening in the living areas such as lounge, dining room and kitchen where there will be a heating demand, however in a conventional system the bedrooms will also be heated during this time regardless of heat requirement in the rooms. As each room reaches its desired temperature the electrothermic head closes the circuit which reduces the amount of heated water required. Room thermostats can be either simple electromechanical, electronic, or more sophisticated digital combined time and temperature units.